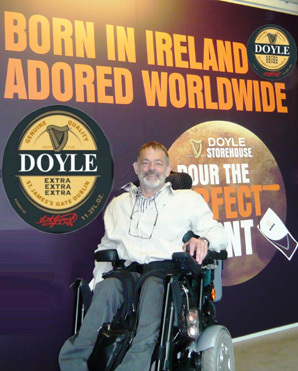 Paddy Doyle was born in Wexford but now lives in Dublin. Paddy is well known for being outspoken on issues such as Disability and Child Abuse. His views have been aired in Canada, the United States and in Europe and the U.K. as well as in Ireland. He was appointed to the The Commission on the Status of People with Disabilities – “A Strategy for Equality” the final report was published in 1996 and regarded by many as the best report on disability in the world. This website has been “up and running” for thirteen years. It is a place where people who were abused can get information or leave comments – indeed anyone is welcome to comment. Comments deemed by the Webmaster deemed to be offensive or defamatory will not be published. Since the website went “live” I’m pleased to say that only two out of many thousands comments were blocked. Please do comment on the website under the relevant headings. You will receive an auto response when your comment is posted or when a response to it is made. I’m indebted to the many journalists who have allowed me to use their copy on this site. I’m also indebted to “PKC” without whom this website would not be here at all. I’ve called on “P” many times for help with rectifying the problems that have arisen for me. Modesty THY NAME IS DOYLE! If you’ve any suggestions as to how the website can be improved or made more ‘user friendly’ do let me know and I’ll see what I can do. thank you so much for your comment, it is much appreciated. I remember that visit to the Marino Institute. I was happy to share my story with your group. It was a pleasure. I appreciate you taking the time to write to me. Paddy, this year marks 10 years since I had the privelage of reading your book and hearing you speak about your story to a small group from the states @ Marino Institute in Dublin. I have shared your story and book many times and there have been few weeks pass that I haven’t thought of you and your family. I’m sure many have told you this but thank you for sharing your story and helping others find the strength to share theirs. I am so sorry for what happened to you. I don’t understand how anyone can be cruel to a child. I am 55 and recently spoke out about abuse I endured from my dad…and many family members, on his side, turned against me. Isn’t that typical? God bless you, Paddy. Thank you for speaking up and for sharing your life with us. Please can i have your email address. I would like to know about the baltimore fund…? I belive there are only two govner on the boardrs . They are going to elect more govners. Is it possible to tell me more as l am one of the boys of baltimore. Reaching out to you once again. I’m sorry you’re not up to par because I have a true story that would make your ( fill in the euphemism) curl! share a strong dislike of political correctness and what appears to be a love of George Carlin. heard it put, be clear be brief and be gone. . .thank you! I have just finished reading Children of the Poor Clares as my mother was detained in St Josephs Orphanage, Cavan. Why was there no report regarding the horrendous sexual abuse and depravity? Today my poor darling mother broke down when she told me of the priest who used to visit from Dublin (I won’t disclose the name). Accompanied by a nun, he would look into the yard and pick which child he would abuse that visit. The nun would then call out the child’s name and she would go up the back stairs and be raped and beaten while the nun would be in the next room (sometimes in the same room). There were three girls aged approximately 12 moved to a dormitory and a cloth was placed over their mouths. They woke up and one of the girl was rushed to the hospital and nearly died as she had haemoraged and lost so much blood, she was given the last rites. The doctor asked “Who did this to you” but she didn’t understand and thought he meant who put a cloth over her mouth. What he actually meant was – Who raped you, impregnated you while you were a child, performed an illegal abortion while you were knocked out, who virtually killed you. All three girls were pregnant and one of them was never seen again. Maybe she just lost too much blood. I am heartbroken and just cannot stop crying. I am so angry that my mother still feels dirty and ashamed. I have just read your book. I have been feeling sorry for myself and distressed and picked up a book to read and distract myself. I want to give that poor wee boy a hug. My partner was abused by nuns at school in st marys dundee.he had calipers and a wheelchair at the time but not now only deformed feet now. Wwhilst itt was nothing like your experience it is in his memory near the surface and occasionally the desire for revenge must be high. The nun/teacher died of cancer. I wonder how much he hurts inside. He normally moves on from things easily but this never goes. I hope you are well, you might remember my project a few years ago 10th president, Ive been developing it and have gotten some support from a few arts offices around the country as well as other survivor agencies, I will attach more details below. I am wondering if you might be interested in taking part, we are hoping to bring together different groups and individuals and begin to develop a campaign. I hope you might consider it and either way thank you for your support in the past. In 2012 as a response to the open call competition for the design of a monument to the survivors of institutional abuse, a proposal was sent to President Michael D Higgins inviting him to step down from office in order to have William Delaney 1957 – 1970 appointed as the 10th president of Ireland. A symbolic gesture of acknowledgment, the invitation was politely refused and subsequently became the subject of gallery exhibitions in Dublin, Melbourne, and Chicago. As we approach 2018 the completion of Michael D Higgins’ term of presidency draws near and with it comes the opportunity to activate a public campaign to put forward the name ‘William Delaney 1957 -1970’ as a candidate in the 2018 presidential elections. The campaign would facilitate a platform where the unresolved and inadequate issues of redress and reform might be presented and represented in as many public manifestations as possible, offering active and pivotal moments of public solidarity and remembrance. Has Irish society fully acknowledged our collective history in terms of the pain and resilience of citizens who as children were neglected and abused, by instruments of the state? We think that moment (not a monument) of solidarity should come. Have the concerns and needs of survivors been fully met? We will utilize strategies of campaign to create a public platform for support where organizations will inform that campaign and voice their concerns as the policy of ‘William Delaney 1957 – 1970’. Can systems and care practices of children today integrate the experience of survivors to find compatibility between vulnerability and the autonomy of the child? Exploring these issues in collaboration with those most affected by them, the campaign will put forward strategies of care of the child. Survivors groups and individuals, advocacy agencies for children in care along with social justice activists are invited to come together under the banner of the ‘William Delaney 1967 – 1970’ presidential campaign to put forward key issues for adequate processes of ‘redress’ and ‘reform’ relating to historical and current institutional care for children. These objectives would be explored by bringing together survivor groups and individuals to speak about the issues of redress, what is needed to adequately address the duty of care which the state has towards those who were affected. Facilitating the coming together of support organizations who could both utilize and offer platforms to explore contemporary strategies of care based on the experience of those who have been mistreated while under the care of the state. Responsibility all of us are implicated not only perpetrators and this project is but one artistic response. Solidarity we stand together and seek change for vulnerable children in care both historically and con-temporarily. Dignify we seek to ennoble the life and potential of William Delaney that was taken from him, his family and society. The campaign does not seek to draw a line under the issue of historical institutional abuse or be some final word on cultural expressions relating to this but asks whether combined cultural agency, social activism and state process can work together to implement an adequate response to our collective history of abuse and neglect. All of Irish society are implicated in the historical abuse and neglect of our most vulnerable citizens and this project is but one artistic response to use the platforms of the 2018 10th presidential elections as a site to present the work and objectives of those working tirelessly for adequate redress for survivors and for adequate reform for children in all situations of state care, under the name of William Delaney 1957 – 1970. If you are interested in being involved in shaping this campaign, informing its direction and utilizing the public platform of the 2018 presidential election. Developing ideas around what a campaign would look like and carry them into action and put William Delaney 1957-1970 before the people of Ireland. Please let me know if you are interested in attending the first meeting to take place in Dublin shortly, (details tbc) and naturally I welcome any comments, ideas, suggestions etc. Your book somehow came into my possession a few years back. The only other connection to the old workhouses and religious institutions I knew was through the film “The Raggy Boy”. I was born in Malaysia and schooled by Jesuits in the 60’s and 70’s. Public caning with the old rattan cane in front of all your classmates during assembly was common. They were Chinese Jesuits, and I guess were no different from the ones of the original order – never a smile, except a sneer. Discipline is good, but these guys took it to the sadistic extreme. Most of them that I knew were heavy drinkers. Your story made me laugh, cry and then some. I was wondering what happened to you after the last passage when you moved into your first home. Glad you are well, after the pompous decisions of doctors and surgeons to “cure” you! I work with disabled people, both from birth and acquired injuries. To me, they have always been just people. Some would be from around your times, when disabilities were seen as a fit burden sent from God. So much knowledge and opportunity was denied from the disabled in those days; so much learned feelings of shame and unworthiness. There was a professor who said “Disabilities are God-given; Handicaps are Man-made.” So true. Keep up the good work, Paddy; you’ve more cojones than so-called “normies”, and have inspired me to push for better care of my disabled clients! Thanks so much for your comment. I appreciate it very much. The last line of your comment is both sad and glad. The sadness is that you had to flee. The ‘glad’ is that you’re a successful businessman in Australia. Keep well. Feel free to keep in touch with me via email if you wish. Feel very special if I had a brother like you. God put you in this life to make others feel good, you are an example to us all. After reading Bruce Arnold’s The Irish Gulag , I thought it time to make contact. I was abused as a child. The instigator was my mother but backed up by my father) an alcoholic) -we lived in a small pub. I was the ‘Black sheep’ in other words. I had to do all the work. Never got clothes- got hand downs from my older brother but this is not an issue. I never got food as the rest did, I was at the end of the queue. And then I had to wash all the dishes after them. I grew up in a small village called Blenerville, Tralee, the resting place of Robert Emmet. As Bruce pointed out-love is needed when young- I never got any love from the family (but was lucky to get it from my aunt(Kay) and uncle(Tim)). I once asked one of my sisters, why was I treated like this! Is there something wrong with me ? and she said there probably is !! Now after fleeing, I’m a successful businessman here in Australia. Hello Jenny, many thanks for taking the time to write. It is much appreciated. Just found this again – so sorry disability has worsened! I Just wanted to wish you the best – because you are one of the best. For what it’s worth I will be praying to the Creator (the real one, not the false god invented by Pedophiles Inc.) for you. Take care. A woman I support has in the last week disclosed to me that she was abused as a child in an institution. Is it too late for her to apply for redress? If so, how can this be right? It can take years, decades even, for survivors of abuse to find the words and courage to tell their story. I just stumbled upon this and all I have to say is INSPIRATIONAL … Keep doing what you are doing ! Feel free to leave a comment. Comments deemed to be defamatory or libellous will not be published.